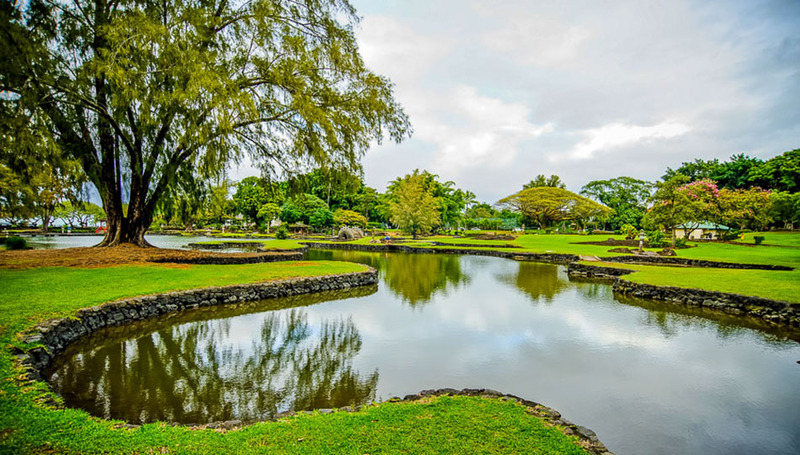 Resting along Banyan Drive, in historic downtown Hilo, you will find the beautiful Lili’uokalani Gardens, the largest, authentic Edo-style ornamental garden outside of Japan. Queen Liliuokalani, donated the original five acres of land to create a public park in 1907. This was increased to seventeen acres by the Legislative Committee concerned with management of public lands in November 1917. Named for Hawaii’s last ruling monarch, Queen Lili’uokalani, the garden opened in 1919 and was styled as a tribute to the first Japanese immigrants to the Big Island who helped build it’s agricultural history starting in 1868. 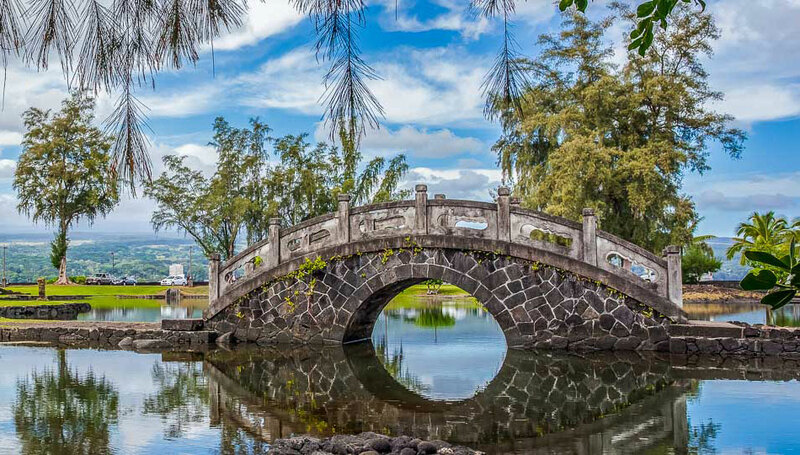 Liliuokalani Gardens features Japanese imported stone lanterns, sculptures, arched bridges and gazebos from as early as 1916. The park was shaped by several groups who put extensive planning, care and resources into it’s development. 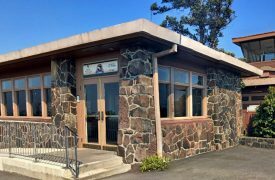 The Hilo Japanese Women’s Friendship Association and the Hilo Board of Trade both contributed greatly to the beautiful park we see today. 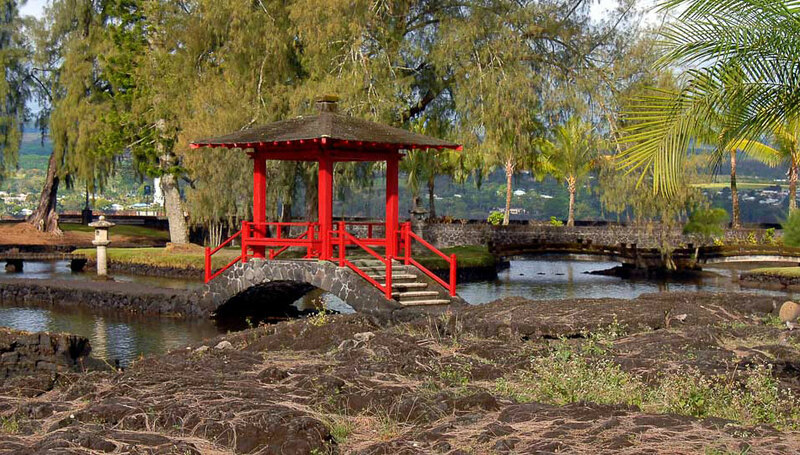 Liliuokalani Gardens highlights plant species and building styles drawn from traditional Japanese temples and gardens. As you stroll along Waihonu Pond, crossing arched red bridges over koi ponds to pagodas, and a Japanese traditional teahouse named Shoroan, you might feel like you’re transported to the incredible temples of Kyoto. 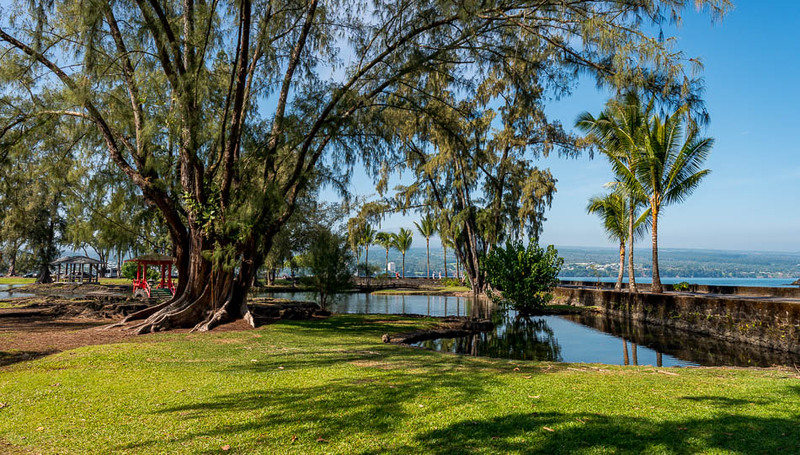 The park is perfectly positioned with expansive views of Hilo Bay and Mokuola, the “island of life”, also known as Coconut Island. 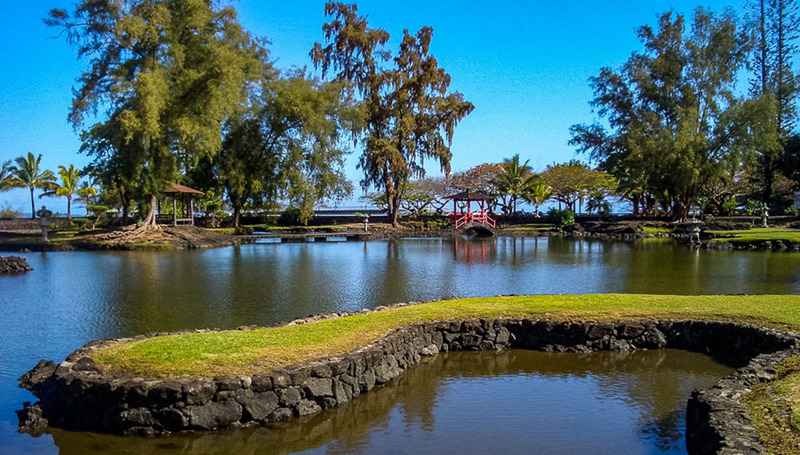 There is a footbridge you can cross to Coconut Island, a great place for a picnic with expansive views to the Hilo Bayfront and downtown historic Hilo. 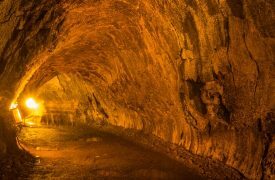 This island once held a Hawaiian temple dedicated to the healing arts. This garden is very popular for early morning jogging, tai chi, and yoga. Take a stroll and enjoy the pleasant scenery along the trails that wind through the oasis. The ponds, bridges, and sculptures create picturesque photo opportunities and are a favorite as a romantic backdrop for wedding ceremonies. 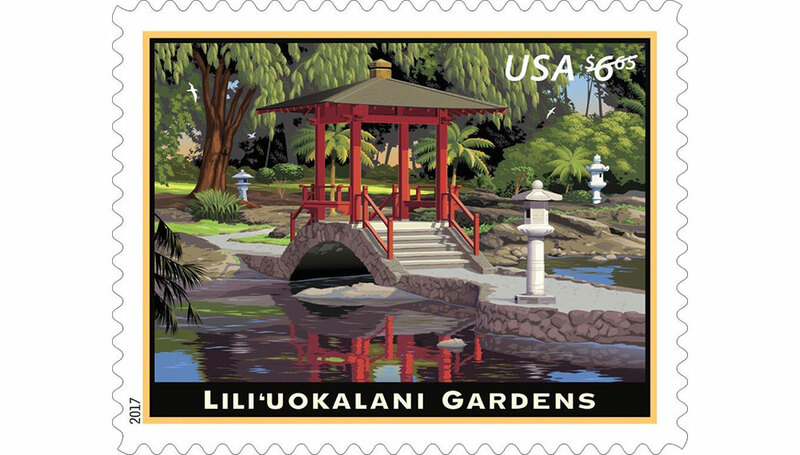 Liliuokalani Gardens is so exquisite that in 2016 the US Postal Service selected the gardens as the inspiration for their US Priority Mail stamp celebrating the people, events and cultural milestones that are unique to Hawaiian history and our great state. For details about Liliʻuokalani Park Centennial go to this Friends of the Park Facebook Page. The park is open year-round, and admission is free. 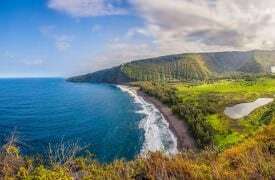 This stunning beach, with sparkling black sand is frequented by green sea turtles and is a sightseer's dream.